Leave M25 at junction 15 and join M4 signposted. The West Slough. Leave M4 at junction 18 and join A46 signposted, Bath and Stroud, At roundabout take first exit Signposted Bath. Continue on A46 entering Pennsylvania, at Cold Ashton roundabout take second exit, keep left, then branch left Signposted Bath, Warminster. At roundabout take third exit Signposted A4 Bath. At Cleveland Place continue forward, at mini round about take second exit, at traffic signals turn right into Landsdown Rd, Signposted Landsdown. Turn left into Bennett Street. 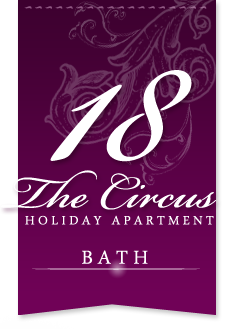 No.18 will be on your right (follow the one way traffic around the circus).